One of the most popular Indonesian dish to try will be Ayam Penyet and there's no other way to have the original taste of its one-of-a-kind cuisine by trying it out at Depot Ayam Penyet located in Bintan Island, Indonesia. It's always a good way to know the cultural background of the country of your visit by trying out their local food gastronomical dishes. Ayam Penyet is a chicken fried with locally infused Indonesian spices served with Asian rice, crunchy tofu and vegetable soup flavoured with locally grown vegetables. I did not search for its food history so I'm just describing it on how it tasted. So if you'll gonna visit Indonesia one of these days, this is one food list you shouldn't miss out. I've been waiting for the right time to finally visit the Island of Bintan in Indonesia and I was totally amazed by it's beauty and the simplicity of the island life here. To experience this place was nothing better than to stay in one of Bintan's best beachfront resort located at Kepulauan Riau Indonesia. You will always fall in love to another beautiful day on this island. Taking a dip / going for a swi, everyday in the crystal clear water has simply a way of clearing your mind from all the clutters of your busy life & perhaps cleansing your soul as well. Every moment and every second in this paradise will always be the best just by simply enjoying the gorgeous Indonesian sunset. We had our reservation here via Deal.com.sg where recently they had tour package promo via http://www.lokopoko.travel and total including hotel, ferry & land transfer with breakfast, lunch & dinner was aroung $99/pax but after including tax & other fees $169/pax. This view will never get old. Wish I could stay here forever. Finally I got the chance to share fashion blog post after several unsuccessful photo shoot attempts. I've been planning of fashion outfit shoot at Henderson Waves or Mc Ritchie Reservoir & hopefully I can make it happen soon. I just went for a beach weekend getaway in Bintan Island Indonesia and part of the tour package we got was a half day tour around the island including this Chinese Temple which was so picturesque enough to have my unplanned photo shoot. Thinking of wearing something comfy & stylish, I decided to wear a white Aeropostale shirt that will never go out of style. 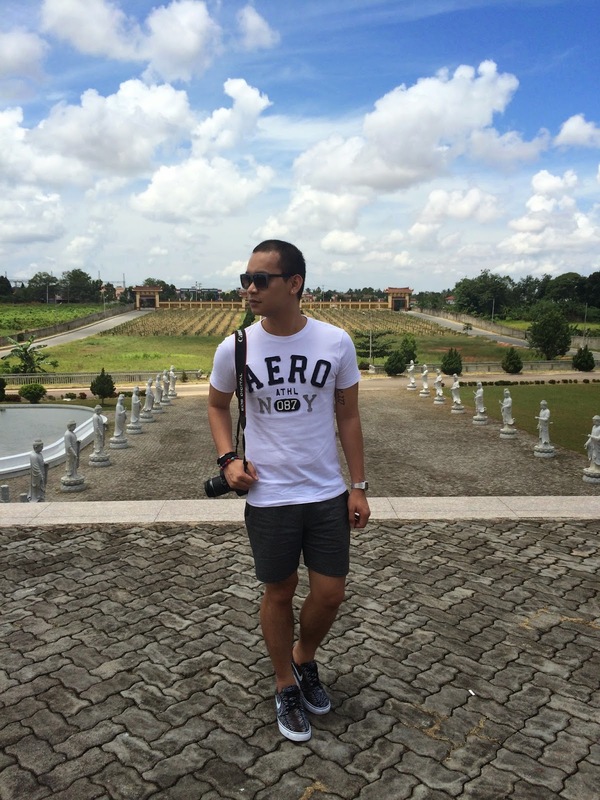 Recently in Singapore, I've noticed plenty style conscious wearing Aero shirts especially during sunny days. For me its the substitute for avant garde fashion brands like CK top or CDG shirts. The one I'm wearing was from a friend who recently visited NYC (sponsorship) LOL! What else could go better with it than my all time fave sweat shorts I got from Forever 21, such a great steal esp I can wear it to any top but still doesn't compromise my style & comfort. I also got my new Nike SB online from www.zumeiz.com This Stefan Janoski limited edition tiger stripe sneakers is just to die for. I love it's simplicity & superb style that really fits my kind-of-style. Also wore my Casio silver watch & black leather bracelets I bought in Hongkong perfect for my usual black-white-gray kind of style. Just goo enough to have my Canon D700 DSLR to capture some scenic views of the island. Hope you like this post & so keep following my humble blog for more fashion insights & style ideas. Chinese Temple Bintan Island Indonesia. I just came back from my weekend getaway in Bintan Island Indonesia. I just can't wait to share my summer-ender weekend stay at Bintan Agro Beach Resorts. So here's the postcards of how awesome my weekend was, just a sample visual diary of my travel escapade. Can't wait to be back here again! Since I'm running out of blog post but still wants to post something worthy for my blog followers, here's my personal motivational write up way back in 2013 back then when I was still passionate enough to make my own 365 inspirational quotes written by yours truly. To draw out more ideas, I added some of my favourite nature photos I've taken to share it all with you guys. Hope you learn something from it. "Dreams get you into the future and add excitement to the present". We all have dreams to fulfill as we grow. Children love to dream about imaginary places and characters. Adults would also have lots of day dreaming activities at times. Dreams are vital to achieve fulfillment in life and to provide reasons for living to put life in this world. But the ultimate dream humankind can have is to be there in the eternal Kingdom in His soon coming. During my recent vacation in Abu Dhabi, I have been impressed by so much things to see and try in this remarkabale country. My impression of this place was limited to desert sand, camels & people walking around in traditional Arabian attire only & it feels to be like the sandbox was such one boring place. But nothing could be further from the truth. Abu Dhabi is still a gigantic metropolis with world-class attractions for the world to see. The best thing about them are their desert safari, water complex and theme park that amazed me until now. Taxis are cheap and plentiful and getting around is very easy. So for all the aspiring tourists: Heres my top 10 must try in Abu Dhabi. There's so more to visit, eat, experience & try but this top 10 are all my personal experiences oin Abu Dhabi that you shouldn't miss out. Book a desert safari drive with one of the many tour operators in UAE. This 4x4s is a powerful off road vehicle to let you experience a roller coaster ride for a more social extreme sport to try in Dubai. Try half-day desert safari tour for AED 180.00 by Sunshine Travel & Tours. Ever since my consciousness for fashion was born, I have this impulsive behaviour to collect fashion items that I do love to wear especially accessories and caps. It started few years back when I started working here in Singapore where high fashion culture influenced me now the way I define fashion and style. It started with my undeniable apercu for rings everytime I will go window shopping. I have rings usually in silver and black but it varies a lot in size, design & concept. I seldom wear them now due to my workplace must-need-to-adapt scenario LOL! But I still wear them a lot during special occasions. I also have boxes of bracelets that I collect everytime I go overseas. From leather, stainless, branded down to ethnic style, I have all of it. I feel so accomplished everytime I open this box knowing that this little precious pieces originated from other countries like Cambodia, Thailand, HongKong, Dubai et.al. The best of part of any vacation will be the holiday feast most hotel chains would perfectly combine to the amenities of the resort like buffet breakfast and specialty restaurant. What else would be better than room service like what I have experienced at Pulai Resort Restaurant located at Johor Malaysia. Your diet will be on vacation mode as well for I'm sure no one can resist all these food selections available in this restaurant. I'm not a totally fan of Malay food but I do love spicy foods so all the Malaysian food items I tasted here were worth every calories intake. Malay cuisine is somewhat similar to Pinoy food for their love with seafoods & local vegetables that seemed to be a staple food items in the menu, except for their one-of-a-kind chili paste that I will always crave for every meal time. The morning buffet was also an intense morning eye opener for the wide selections of Asian, American & Western breakfast menu selections from the basic cereals & toasted breads down to their delectable dumplings & omelettes. I had some healthy options for this buffet and tried to taste the unusual ones I seldom eat back in Singapore. So just drool over this liscious foods I had at Pulai Spring Resort Malaysia and forget about the diet thing just once in a while. Hope you enjoy this blog post. Located along River Valley Road, this bistro & bar is the ultimate hang out place for a Sunday wine night, drinking spree with friends or maybe if you just wanna grab a bottle of beer with a friend for some good night talk. PappaMia Bistro & Bar is situated near the infamous Spize so it's easy to spot & was recommended by a friend of mine whose working in GWC area. I would always recommend to try their truffle fries & chicken pops for pulutan (side dish). You also have to try their long island tea wherein alcohol level can be personally requested to be modified LOL! (Thanks to the friendly staff) Or you can have a bottle of Merlot red wine as well. The bar comes with indoor & outdoor seating area & the food & drinks are really affordable. Worth a try! A quick escapade to escape the busy life in Singapore will always be a travel plan I'm looking forward as always. Pulai Resort located in Johor Bahru Malaysia is a must-go destination if proximity & affordability is of primary importance. It was a quick awesome travel trip as the whole housemates were present to spend a day of relaxation in this nearby paradise. 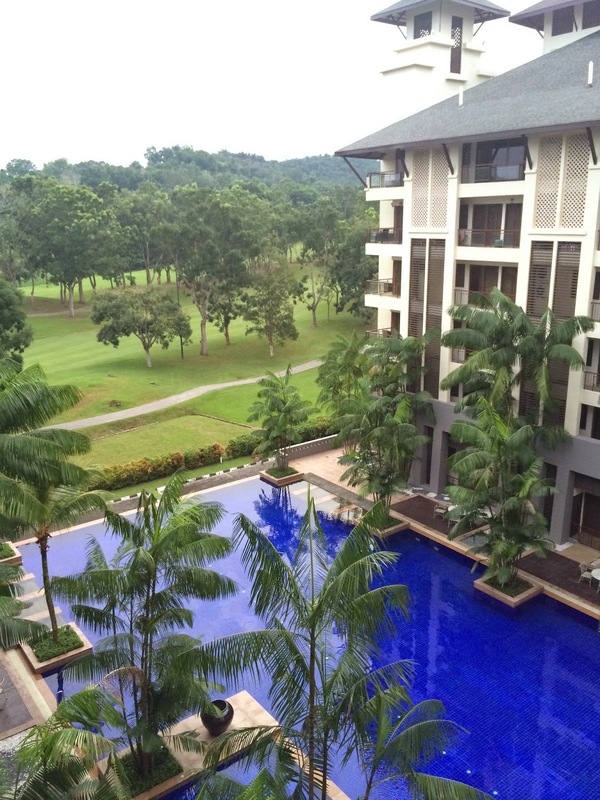 A world class golf and recreational resort hotel in Johor Bahru, designed as an ancient Royal Malay palace with the timely ambience of an exotic tropical resort providing an unmatched golfing and recreation experience. With comprehensive social, recreational, dining and sports facilities, Pulai Springs Resort is a family unit’s sanctuary designed to cater to the family as a whole. In need of respite after a long day, return to the resort with a spa treatment in mind. Indulge in The Pulai Spa’s extensive list of treatments for total spa rejuvenation. Stay in luxury accommodation at The Anugraha (means “Blessings of God” in Sanskrit), a 22-room tropical resort style boutique hotel with elegant bedroom suites or Cinta Ayu All Suites (means “The Love of Beauty),hotel service apartments offering a unique blend of modern luxury and traditional craftsmanship. Discover a unique dining experience at the award winning Qing Palace Chinese Restaurant from the plethora of dining choices in the hotel. The restaurant delights you with a spectacular parade of thoughtfully crafted dishes, giving you the ultimate sensory satisfaction. I do love pasta from American dishes with Asian influence. 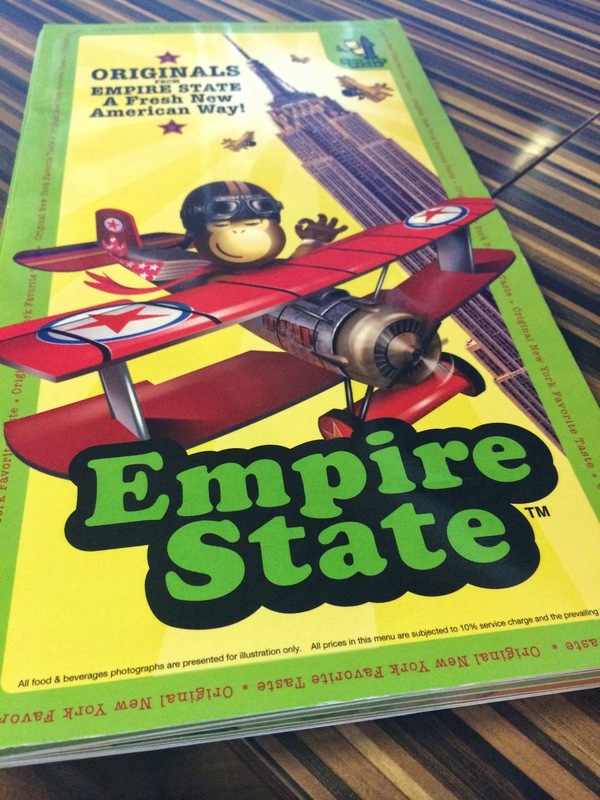 Browsing the menu having wide mouth watering selections like soups, salads, pasta, pizza, ribs, burgers, hotdogs, milkshakes and luscious desserts, that's exactly why I keep coming back at Empire State Restaurant at my favourite outlet at Causeway Point. My ultimate choice on their menu will be the Empire State Spaghetti Bolognese with Giant Meatballs. Resistance is futile. Even the mafia trembles at this unremorsefully huge serving of spaghetti with loads of bolognese sauce topped with a montrous-sized meatball and garnished with freshly grated parmesan cheese. Only at Empire State! Try out Spaghetti Carbonara with Bacon & Mushroom, with the wonderful combination of sauteed mushroom and bacon, served with garlic cream sauce and freshly grated parmesan cheese. Definitely you can try as well the Spaghetti Alio with Bacon & Mushroom with large portions of bacon, mushrooms, finely chopped garlic, olive oil & chili flakes. A new definition of clubbing in Singapore will be the 1-Altitude known as the highest rooftop bar in the country for an ultimate experience of nightlife in the scenic night life of Singapore. Occupying the three topmost floors of the 282 metre One Raffles Place Building, 1-Altitude comprises of three very different concepts—an al fresco gastrobar called 1-Altitude Gallery & Bar on level 63; an European restaurant named Stellar on level 62 and a sports bar named 282 that comes complete with its own golf simulator on level 61. 1- Altitude offers the best view of Singapore while you chill out with friends over an extensive wine & cocktails menu with the lively house music of guest DJs. It was my first time to spend a memorable night for celebrating my friend's birthday so we got a reservation for a big table, bottle of beers & anacks while we party like it's the end of the world. I recently had a taste of Italian food from Trattoria Italian Kitchen located at 313 Somerset here in Singapore. Recommended by a friend from F&B line, I was sure then of how authentic & good tasting this restaurant offers. It was a birthday dinner celebration of my friend Israel and we're both craving for pizza, so we skipped from our choices of some popular pizza chains like Pizza Hut or Dominos Pizza to try something special & found out this food haven that's usually crowded during weekends. Italian cuisine is known for their pizza and pasta so we decided to have Three Meat Pizzeria which includes tomato, cheese, pork sausage, ham & pepperoni. For the special pasta, we ordered the Baked Lasagna with Bolognese & Bechamel which is an oven baked lasagna layered with beef ragu & bechamel sauce. As for the drinks, we had soda water with various flavours to choose from like apple & strawberry soda taste. The ambience is so laidback and I noticed that everyone just love Italian food. The menu prices are usually budget friendly with quite good customer service to assist and even give you compliment Italian bread. What a great treat! July was indeed a life changing month of this year 2014. After my awesome vacation in Philippines, my mindset was totally refreshed whereby I started to focus again on my long term goals and the rest of it just continued to happen. I only had one short travel to Malaysia this month as I realized I had so much of travel experiences of almost going overseas every month. So if you noticed, my blog was flooded nothing but food related topics from my recent travel in Hong Kong & Manila. I will not be travelling so often until end of this year so my blog post will focus more on fashion outfit & my idea of "Top 10" for all the countries I visited so far. Aside from getting my head shaved & getting inked for the first time, this month was also the most blog post I had so far, making sure to share blog every other day. (that's quite tough you know) But as what they say, I'f you love what you do, everything will just come so easy. So here's my photo diary for Instagram July 2014.